Sense+ iPhone Dock With Built-In Smoke Detector Might Just Save Your Life | OhGizmo! By Hazel Chua on 06/27/13 • Leave a comment! People have really begun giving more thought to how they make smartphone accessories. For example, the conceptual iPhone case with a built-in carbon monoxide detector could especially come in handy if you’re wary about carbon monoxide poisoning. Then there’s the Sense+ iPhone dock that does a one up on the case, because not only does it come with a gas detector, but it also has a built-in smoke detector and alarm. The Sense+ isn’t just a concept though; it’s an actual product and it’s currently up for funding on Indiegogo. It’s a smart dock that comes with a companion app that provides you with custom personal protection options to safeguard the life of you and your family. The Sense+ features a photoelectric smoke and gas detection sensors that can detect cold smoke that other systems might not be able to detect. This photoelectric sensor is then combined with a carbon monoxide sensor as a backup of sorts to protect you from even more threats. 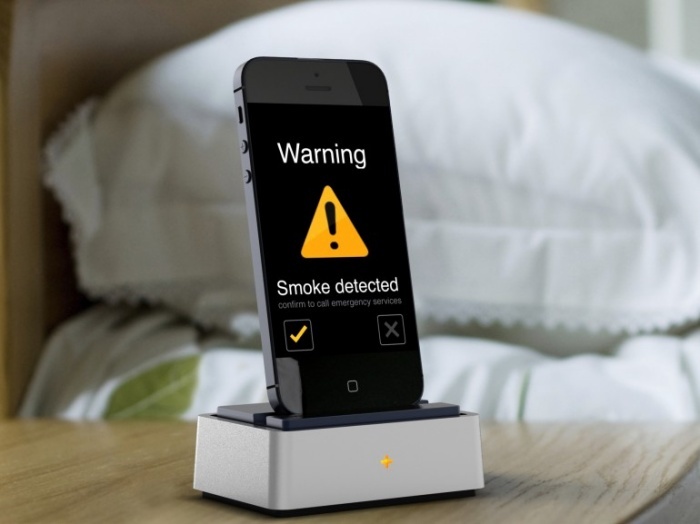 Once smoke is detected, an alert pops up and the Sense+ app will automatically start up the iPhone. If the user doesn’t respond, an alarm is sounded and the companion app will call emergency numbers listed on the phone. The Sense+ draws power from the mains or from the docked device. It also has a built-in battery as a back-up power source. The dock is designed for iPhone 5 smartphones, but other devices can be connected via USB. The Sense+ Dock is currently on Indiegogo, where a minimum pledge of $79 will get you one of your very own.